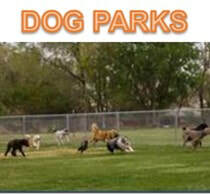 Dog Parks - TAILS Foundation Inc & PETwork Society! Park Hours: 6 A.M. to 10 P.M.
behind fire station. Just north of 15th Street Exit off Interstate 90. Directions: On Interstate 90, look for the green highway sign marked "State Line – Exit 299." After exiting, drive towards the Spokane River following the blue "Visitor Info" signs north then east to Spokane Bridge Road and the parking lot. Restrooms for people and drinking fountain for dogs (not available during winter months). Double gated park entrance and 6 foot chain link perimeter fence. Grassy area for playing fetch and a wooded, natural area for walking. Paved path surrounding the grassy area makes the park wheelchair accessible. Baggies for cleaning up after your pet are provided for your convenience. Picnic tables available within the park. You remain liable for damage and injury inflicted by your dog(s) and subject to all applicable Washington State and Spokane County laws while in the off-leash area. Dogs deemed potentially dangerous or dangerous by any recognized animal control authority are prohibited. You must maintain control of your dog(s) at all times. No more than three (3) dogs per handler and dogs must be attended at all times. Any dogs exhibiting dangerous or aggressive behavior, e.g., biting and fighting, are prohibited and must be removed immediately. Female dogs in heat are not allowed. You must leash your dog when it is outside the off-leash area; you must carry a leash for each dog while you are inside the off-leash area. Remove your dog’s pinch or choke collar before entering the off-leash area. Any person bringing a dog into an off-leash area must clean up feces after the dog, dispose of feces in the containers at the off-leash site, and visibly carry equipment for removing feces at all times. Any children less than 16 years of age in the off-leash area must be accompanied by a parent or guardian. Bring food into off-leash areas at your own risk – no glass containers or alcohol allowed. Bicycles, skateboards, and other wheeled items are prohibited inside the off-leash area. Encourage dogs to greet slowly. Curving the body away from the other dog is better. Smelling the rear-end is always best! Ask your dog to face you. Give your dog a treat for facing you. Allow the unfamiliar dog to sniff your dogs behind. Now have the unfamiliar dog face his owner. Allow your dog to sniff the behind of the unfamiliar dog. Ask first before you give a treat to someone else’s dog. If your dog is a Dog Park "first timer," then visit the park during quiet times. Please do not allow your dog to mount other dogs. Plastic bags needed for clean-up You can help keep our Dog Parks sanitary and enjoyable by remembering your responsibility for clean-up. Waste disposal tools and receptacles are handy whenever and wherever you need them. You will find plastic bags as well as racks and shovels at several locations throughout the parks. Dog Park patrons are encouraged to bring medium-sized plastic bags for the tube dispensers. This is a great way to help lower costs for the Dog Park and re-use bags that you might otherwise throw away. Remember, if you don’t recycle it, re-use it!